If you haven’t been to Rooster’s in a while, do yourself a favor and get over there. We decided to go after a chef friend recommended it so highly. She told us that the Executive Chef, Zack Renner, was amazing and that they served her farm’s pork. That’s all she had to say, we were there. We reserved a table for 8 so they put us in a room that looked like it might once have been the hallway of a small strip mall. BUT they’d doctored it up with pretty twinkle lights and a nice fountain in the middle. And then there was this adorable pig door holder we were all entranced with…and we weren’t alone. A few people stopped to take pictures of Porky. Our waitress was so kind and deftly handled our large(ish) group by giving us suggestions, fixing drinks when we weren’t satisfied and delivering the bad news about dessert. The management also stopped by a time or two to make sure our night was going well..which it very much was. Cocktails are the best way to begin Girl Nosh. Rooster’s has a fine selection of wine, brews and mixed drinks. This one (I forget the name) was muddled cucumbers, raspberry and gin. I have to admit it wasn’t for me, but others at the table found it refreshing and light. To soak up all of this alcohol, they brought us an assortment of delicious baked breads with olive oil and balsamic vinegar. The bread was hearty and delicious. Very nutty. Housemade bresaola. I didn’t try, but doesn’t it look great? 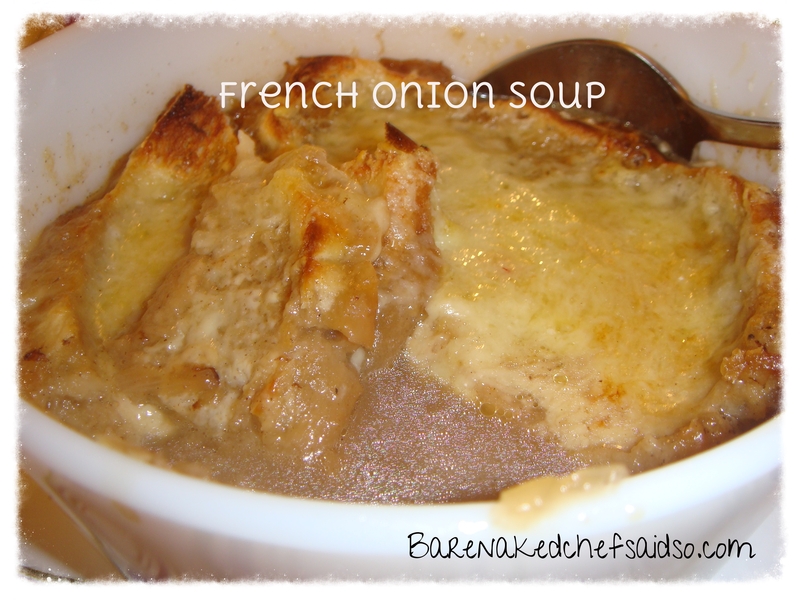 The French Onion soup was not one of my favorite soups. It was hearty, but not as flavorful as it should have been for such murky and dark broth. I didn’t opt for it on my second visit. The salads were all so fresh and dressed perfectly. This one was on their daily offerings page, meaning it was what was fresh at the farmer’s market: Whole romaine leaves topped with walnuts, tangerine slices and grated Pecorino Romano cheese. Perfect. The next salad was baby arugula, chopped pears and chevre cheese. Yum! My salad was a wedge. I don’t know why I’m not more adventurous. I just love a wedge. And this one was perfect. The cold, crispy iceberg lettuce topped with creamy, tangy blue cheese dressing is a comfort food. This one had some pickled red onions on top that were both sweet and tart, and really gave the salad a punch! When you go to Rooster’s, you must have something that was wood-fired or wood-grilled. Shannon got the salmon, and it was perfectly cooked…charred on the outside and tender on the inside. She was so happy with her choice! Other dishes I didn’t try but were reported to be delicious: Wood-Fired Joyce Farms Natural Chicken. Laurie said it was tender, full of flavor and really juicy. Anessa got roasted veal with mushrooms and blue potatoes. It sat in a deliciously flavored jus and drizzled with aioli. Perfection. One of the best dishes for the night was Jennifer’s braised beef short rib. Tender as a a slow-roasted pot roast, but packed with flavor. The meat just melted in your mouth! I have mixed feelings about my entree. I got the fried oysters, and while they were perfectly delicious: crispy on the outside and creamy on the inside with a nice briny flavor, I’d come to a restaurant that has “wood-fired” in its name and didn’t get something from the grill. Supremely stupid. You can get oysters at a fish camp. Stick with something with the taste of fire. Have you ever seen a cheeseburger that looked this yummy? And shoestring onion rings to accompany. That’s not even fair. Amazingly simple spaghetti. Perfectly balanced and flavored. Buttery seared scallops. Oh my. You know, sometimes side dishes are predictable or dialed in. An afterthought. At Rooster’s the sides are at center stage alongside the entrees. All sides here are designed for two people, but are so good you may not want (or be able) to share. The fried corn should be your first choice. It’s real corn. Not from a can. And it is pan-fried with spices that make is lip-smacking good. The stone ground grits are another perfect choice. Little nuggets of corny goodness are buried in them and there is plenty of heavy cream to make them rich and velvety. One of the best things I’ve ever put in my mouth was the wood-fired sunchoke. It sure didn’t look like much more than a ginger root when it came to the table, but the taste was amazing. When I saw the word “sunchoke” I immediately conjured images or the artichoke. The sunchoke, however, is a tuber, like a potato. It was creamy and had a little bit of sweetness to it. The wood firing brought out a nuttiness in it as well. Very complex for such a simple dish. One of my favorites for the night! Another favorite is this mess 🙂 This is a mix of mushrooms, which is probably one of my favorite foods in the world. The table agreed that these were a favorite. They were lightly seasoned and gently cooked, so their true flavors shown through. Macaroni and cheese: soupy and creamy…yum!! By the time we were done eating, most of the tables around us were empty. And they’d take our top dessert choice with them: the coconut cake. We didn’t let that stop us, though. We all ordered the back up dessert which was an apple tarte. The waitress called it something else, but for the life of me, I cannot remember what that was. To describe it I’d say it was dried apples (re-hydrated, of course) placed atop a buttery and light croissant crust. It was accompanied by a scoop of vanilla bean gelato and a spill of rich caramel sauce. Even though apples aren’t my favorite dessert fruit, this reminded me of the fried pies my grandmother used to make. The apples had a tart but sweet taste and were very soft. The crust wasn’t overly sweet, so it was perfect with the gelato and the caramel. Decadent and delicious! Chocolate Milkshake: Runny and chocolately, just like I like it. We at Girl Nosh all agreed that this was one of our favorite places we’d been to. That’s saying something, because we’ve been to some fine restaurants. You will need a reservation, but you can make them on OpenTable.com. Go on and get that done now. You are welcome. I think French Onion soup is my favorite soup of all time. The KING of soups! When I was a kid, I almost choked on a big glob of cheese while eating a cup in the mall, but now I am much more careful. Smaller bites. Chewing. My favorite soups are ones that have a rich broth, not too many chunky onions, but enough so that the bread doesn’t absorb all of the liquid. The cheese on top should be a lovely mixture of gruyere, gouda and mozzarella. Never too much. Combine onions, broth, consomme, and soup mix in a slow cooker. Cook on HIGH setting for 4 hours, or LOW setting for 8 hours. Ladle soup into serving bowls. Top with a slice of French bread. Sprinkle 2 tablespoons cheese over each bread slice. 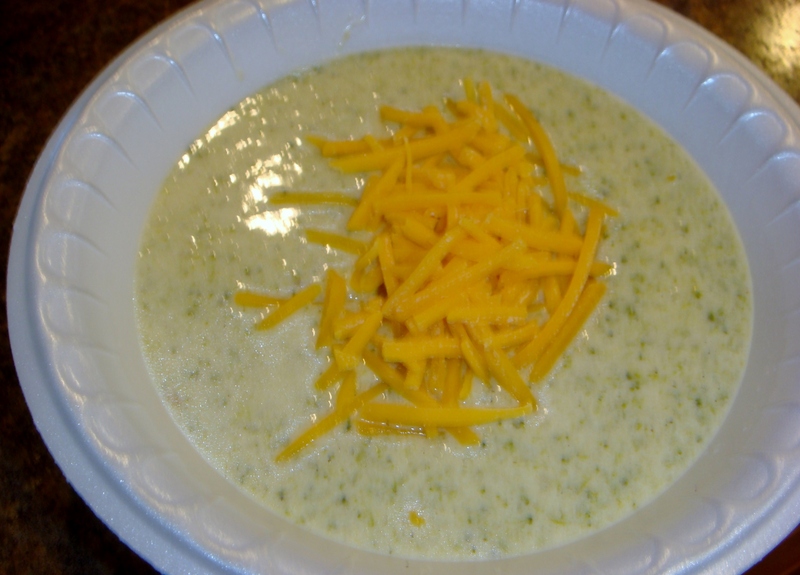 Put soup bowls under broiler until cheese is melted. Alternatively, place the bread on a baking sheet and top with cheese; broil until cheese has melted, about 30 to 40 seconds, and set on top just before serving. Saute onions and garlic in oil over low heat until tender and golden yellow. Sprinkle flour over onions, cook a few minutes more, browning the flour well. Add stock and wine and bring to a boil, add thyme and bay leaf. Reduce heat, cover, and simmer gently for 20 minutes or so. Add salt and pepper, to taste. Meanwhile, slice French bread into 3/4-inch slices and butter both sides. Toast slices on griddle until golden brown. 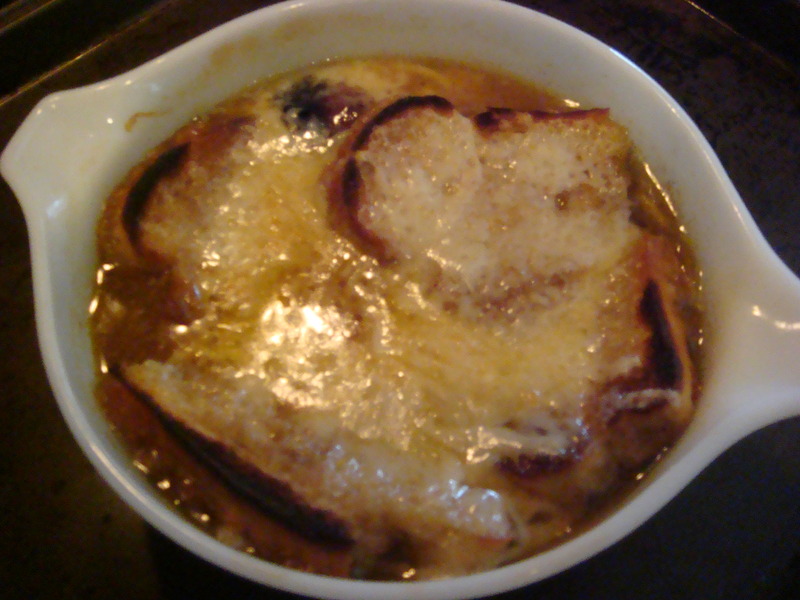 Ladle soup into an ovenproof bowl, add toasted bread and cover with cheese. Place ovenproof bowl on a baking sheet lined with tin foil. Bake at 350 degrees 4 or 5 minutes under a hot broiler. Heat butter in large pot and cook vegetables until tender over low heat, stirring occasionally. Add flour; cook 5 minutes, stirring constantly. Gradually stir in broth until blended. Bring to a boil, cover and cook over low heat 5 minutes. Add rice and chicken and heat another 5 minutes. Stir in hot half and half. Heat, but do not boil. Minestrone soup is an Italian classic. This one is simple and flavorful and warms you up on a cold winter evening. Add onion, garlic, carrots, and basil and cook for 5 minutes. Add zucchini, tomatoes with liquid, bouillon, cabbage, salt, and pepper. Bring soup to a boil. Reduce heat and simmer covered for an hour. Rinse beans. Add the beans, rice, and wine. Cook for 30 minutes, or until rice is done. You can eat this now and top with cheddar cheese, but it is even better the next day. Cook onions in butter until tender. Blend in flour and seasonings and cook 3-4 minutes, stirring constantly. Add boiling water and bouillon cubes and cook slowly until thick, stir in milk until smooth. Add the cheese and broccoli and heat through. Garnish with fresh chopped parsley.